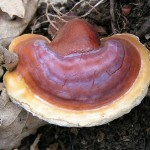 Reishi mushroom can look quite scary because of it’s color, but it is not poisonous. In fact Reishi mushroom has many health benefits. These include controlling high blood pressure and improving immune system. Reishi is also known as Ganoderma Lucidum and Ling Zhi in Chinese. It grows in many parts of Asia.